To be honest, I wasn’t sure whether I was gonna write a review on this album or not. Because to be frank, a solo album from this guitar shredder didn’t really interest me. Sure, there is some news value in the respect that Gus (born Kostas Karamitroudis) is Ozzy Osbourne’s guitar player and, yeah, he’s a really good one too. But the days when the double O presented a new hot guitarist that would change his whole approach with both skills and song writing are long gone. Randy Rhoads, Jake E Lee and Zakk Wylde were all players that contributed with their own style and melodies (Brad Gillis (Night Ranger) and Bernie Tormé were only temporary replacements and therefore aren’t ancillary), but ever since Zakk left, his replacements Joe Holmes and now Gus were only players hired to replicate their predecessors in style. That said, watching Ozzy live makes for great entertainment and Gus is not only a great guitarist, he’s a really good showman as well. Also, Gus own band, the Greek heavy / power metal band Firestorm aren’t really that much to write home about – standard metal that goes in one ear and out the other. On the other hand, Gus has managed to find some real interesting guest players / singers to his first solo effort and the more I thought about it, the more interested I got. Not being a huge fan of power metal, I hoped that all the guests had provided some diversity and that this album wouldn’t just be another Firewind record with different vocalists. The first thing I heard from the album was the single and video “My Will Be Done” featuring Swedish voice Mats Levén (Swedish Erotica, Treat, Yngwie Malmsteen, Therion). The song was ok, but forgettable and ordinary and it didn’t stick at all. Style wise, I was thinking about Mats’ old band Southpaw (that also featured Opeth guitarist Fredrik Åkesson and Europe bass player John Levén), only not as good. This song was another reason for me being a bit hesitant to check the album out. Listening to the album, the song hadn’t really grown and I’m kind of surprised that it ended up being not only the first single but also the opener on the album. However, on the notice that after the rain, sunshine will appear, I state that the album gets new life with “Blame It On Me”, also sung by Levén. It’s a somewhat commercial hard rock track with a really catchy chorus and a killer melody. The title track is also a great tune, featuring American metal band Devour The Day. It’s a hard rock tune that borders to metal with a great hook and “Vengeance”, a metal instrumental that features Megadeth bass player David Ellefson really catches my ear. Instrumentals are a double edged sword for me. There are some really good ones, but I have a hard time embracing them, so the fact that I really enjoy this number is something out of the ordinary for me. “Long Way Down” is a ballad, but not a big cheese ballad. It’s more a metal ballad and the features the brilliant voice of one Alexia Rodriguez of the metal band Eyes Set To Kill. Can’t say I have ever heard of them but Alexia sure is damn fine singer. Ever heard of Jacob Bunton? well, he’s the guy that fronts both ex-Guns N Roses drummer Steven Adler’s band Adler and his own band Lynam. He sings on a great melodic rock tune called “Just Can’t Let Go”. Now, Bunton must have had a hand in the song writing here because this song could really have been a Adler or a Lynam song. Billy Sheehan (Mr Big / Winery Dogs) plays bass on another instrumental, “Terrified”, a Yngwie Malmsteen – like metal track and yeah, I really like that one as well. Mats Levén provides vocals for the heavy “Eyes Wide Open”, a great track and a favourite of mine. Gus brings in Steel Panther singer Michael Starr (Ralph Saenz) for “Redemption”, a straight forward hard rock song that is ok, but not more. Problem with having Starr as a guest singer is that it’s impossible not to think of Steel Panther when listening. Yes, Starr is a very good singer, but I can’t help getting Steel Panther vibes, which doesn’t really help when you’re listening to serious album. “Summer Days” has Jeff Scott Soto (Talisman, Yngwie Malmsteen, W.E.T., Eyes) singing and this brilliant melodic rock pearl has Jeff Scott Soto written all over it. Could have been a Jeff Scott Soto solo song. Same with “Dreamkeeper”, that has Evergrey singer Tom S Englund on it – it’s a really good ballad, but it sure sounds like a Evergrey track. Finishing “End Of The Line” is a heavy, ballad-like hard rock song. A good one, but it doesn’t really go anywhere. Guitar players that releases solo albums that have different singers on different songs is nothing revolutionary, Slash and Tony Iommi has done the same thing, but the hardest thing is to make those sound authentic. I love those albums, but they kinda sounds like a compilation album with different bands. This one doesn’t, apart from a few tracks. That’s not to say that Gus’ album isn’t varied – it is – but the songs sound like they’re all written by Gus and then handed over for the singers to sing, even though I have a strong feeling that Gus had a helping hand or two among the many musicians that appears on this album. Also, one of this album’s strongest forces is the one of Mats Levén’s voice. The guy has – now in his late forties – still one of the most powerful and wide-ranged rock voices you could find, a voice that can lift a song to a new level. It’s really nice when you get to be pleasantly surprised, because this album is surprisingly good. 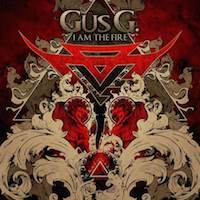 I might never be a Firewind fan, but with a great release like this I gladly call myself a Gus fan. Well done! How the hell do you go from “Kostas” to “Gus”? That’s like going from Jon to Wilbur. Really interesting guests on this. And speaking of Sheehan, that Paul Gilbert solo album I bought was excellent. Haha. But I guess it’s kinda like going from Frank Ferranna to Nikki Sixx…. Well, this album was a huge surprise. I really love when that happens. What was that Paul Gilbert album called? Please review it. True! Frank Ferranna isn’t a very rock and roll name though, is it? I always wondered what I would change my name to, if I became a rock star. As a kid I settled on Michael Ladd, for lack of ideas. Oh and I will review Paul. It’s called Get Out of My Yard. On the other hand, Mike Ladano works just fine, in my opinion.